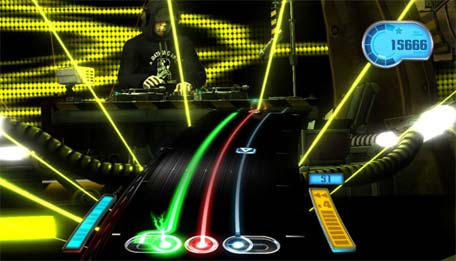 We're Officially Stoked For The Release Of DJ Hero. 25 Days, Y'all! It's coming October 30th. Hooray. Needless to say after a love-hate affair with the game, the PushSquare offices have decided to love and currently have a big countdown on the wall counting down to DJ Hero's release (we don't really have a big countdown - Ed). Yes it's expensive, but it has Daft Punk among other tracks we deem to be enjoyable. Which is quite unlike any other music game (The Beatles: Rock Band aside, mind). Europe will probably be the biggest territory for DJ Hero, with the club scene still massive over here. We suppose that's part of the reason we're so stoked. If you're interested, our preorder is with Amazon. They currently have it available for £89.99 (which is a £20 saving). If you preorder, Amazon will honour the price at which you ordered it. Which is neat. Plus the boxart rocks. Oh, and it looks like they're giving you £2.50 of free DLC for ordering too. Even better. Did you notice we're rather excited about DJ Hero? Anybody else out there interested or, just us?